In 2006, the Montgomery County commissioners created the Montgomery County Jail Financing Corporation in order to build the Joe Corley Detention Facility. To finance the facility’s construction, the commissioners sold $44.8 million in tax-exempt revenue bonds. As part of an agreement with the IRS on retaining its tax-exempt status, after five years 30 percent of the facility’s prisoners were expected to be from Montgomery County, with the goal that eventually such non-federal prisoners would occupy close to 100 percent of the beds. In the meantime, through contracts with the U.S. Marshals Service and Immigration and Customs Enforcement, the facility would generate revenue for the county by housing federal inmates. The facility was built in 2008, with Florida-based GEO Group contracted to handle operations. Yet today, there are still no county inmates at the Corley Detention Facility, and the Montgomery County Jail is still several hundred inmates shy of capacity, leaving the tax-exempt status of the revenue bonds at risk. If the county wanted to keep the facility, the commissioners would be forced to refinance the debt through taxable bonds at a higher interest rate, resulting in a negative cash flow and more taxpayer money spent. Instead, the commissioners voted on January 17 to sell the facility. Selling the facility means incurring $7 million in penalties for retiring the bonds early, added to the $38 million the county still owes, pushing the total debt to about $45 million. In preparation for selling the facility, the county hired at a price of $11,500 the Illinois-based appraisal firm Argianas and Associates Inc, who subsequently set the market value of the facility and property at $42.2 million. In spite of this, the commissioners plan to start the bidding process on the Facility at $55 million, and expect to get more. 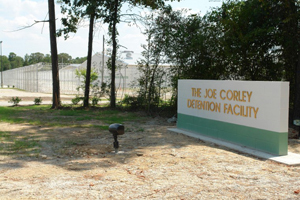 In the business world, the investment in the Corley Detention Facility would be deemed a failure. The risk of building the facility involved generating enough revenue through housing federal inmates in order to pay off the debt, while at the same time assuming increasing incarceration rates at the Montgomery County Jail would be enough to spill over into the facility within five years. Like all risky investments, they may turn out great, and they may turn out to be a disaster. But counties should not engage in entrepreneurial government and expect the taxpayer to underwrite the risk associated with such projects as the Corley Detention Center. There have also been discussions on the potential sale of another county investment, the Montgomery County Mental Health Treatment Facility, which also receives funding from the state government on behalf of state Senator Tommy Williams, who secured an annual $7.5 million for the facility as a budget line item. Both the Mental Health Facility and the Corley Detention Facility are under investigation by the FBI for their procurement practices, along with the company contracted to build both facilities, Shenandoah-based Alliance Development, Inc.